These industrial burners TPBY...VS with pneumatic atomization and electronic operation, have been designed for all those applications in which monoblock models are poorly suited or entirely inadequate, such as wherever the power values at the firing would otherwise require the use of built-in fans of excessive size, whenever combustion air pre-heating is provided, or again, whenever the primary noise source must be shifted to soundproofed areas. The range runs from 900 kW to 19000 kW power in different constructive versions as required by the type of final system or specific client needs. This industrial burner design project was developed to obtain the greatest versatility in order to achieve the objectives posed by the client, and therefore in respect of the widest range of technical specifications. For example, combustion heads with air inlet from above or below the firing, axial or tangential air flow. This means that the machines can be personalised as required by size and performance in different industrial sectors that offer differ widely one from another. All the combustion heads are obviously available in the versions for heavy oil. All the burners are available for oils with viscosity up to 4000 cSt at 50 °C (530 °E at 50 °C). Personalisation in these cases is almost inevitable and entirely feasible with our range, and all such requests are carefully analysed, one by one. 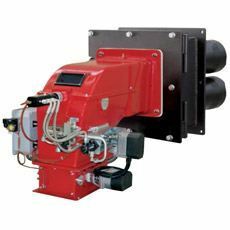 Burners "VS" series are equipped with multiple firing heads in order to achieve a shorter flame.